The flawless defensive record continues for Dundalk, but Stephen Kenny's side are suffering unfamiliar problems in another department. Five games into the new season, the goals-conceded record stands at zero. However, three scoreless draws illustrate where they have work to do. They controlled the game against a well-drilled St Patrick's Athletic side for long spells but there was an absence of a real cutting edge. 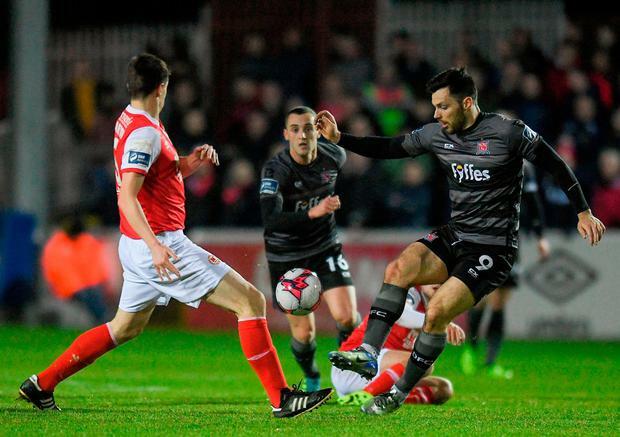 And while the morale-boosting success over Cork lifted Dundalk spirits ahead of this Dublin trip, they were aided by a goalkeeping howler to get those three points. More inspiration will be required in the attacking third if they are to win games such as this one, an issue that has seldom troubled Kenny in his tenure. This was a good point for the Saints, who are generally a side that set out to control games and they had to adapt to a role reversal. In terms of possession, they were a clear second best before the interval, although they did step it up thereafter to earn their reward. 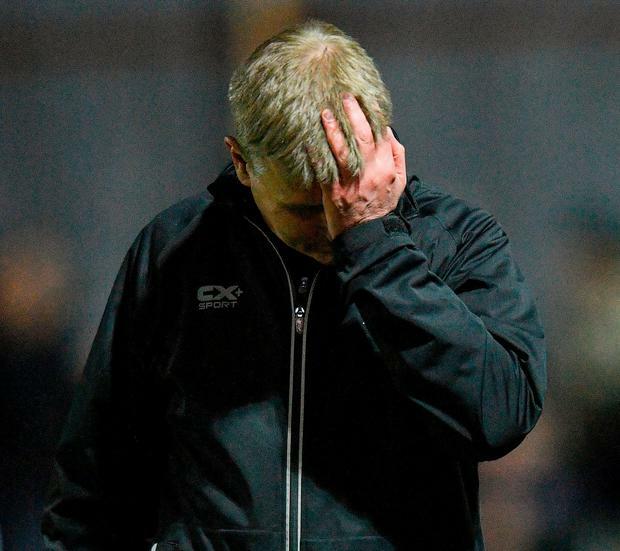 Liam Buckley's charges had to dig in to win at Dalymount Park on Friday and called on more of the same attributes here with Dundalk tidier on the ball. In saying that, Kenny was vocal on the sideline, urging his players to move the ball quicker and open up the compact hosts. Evidently, he felt there was a lethargy about his team's play. The Louthmen should have been ahead at the halfway point, yet they had relied on pressure and dead balls to fashion opportunities save for an early chance from Pat Hoban that came from a long ball forward and a Saints misjudgement. 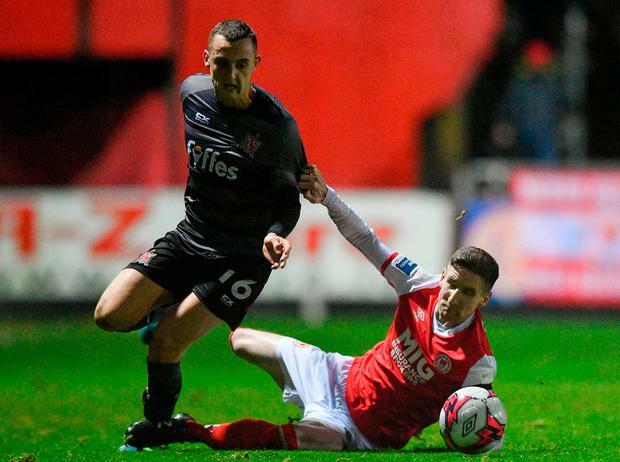 But Saints players were in the right place to prevent certain goals on two occasions in a frantic spell with Dan Cleary's header swept off the goalline by Darragh Markey and Kevin Toner's acrobatic diving header frustrating Ronan Murray. From the restart, Buckley's men showed more attacking intent, although the risk and reward element of that was highlighted by a quick Dundalk break that allowed Dylan Connolly to tee up Hoban with Murphy responding smartly again to cut out the danger and take a boot to the body in the process. When a Murray free-kick struck the bar after an irate Owen Garvan was forced to foul Michael Duffy, the Saints were again surviving by fine margins. That said, winter recruit Simon Madden was more visible in the second 45 and the roving right-back's cross was headed over by Ryan Brennan, a passage that brought some volume to Inchicore voices. And as the game became slightly ragged, there were moments when a better pass from the Saints might have exploited space. Kenny emptied his bench in search of a winner, calling on his foreign contingent and Krisztian Adorjan squandered the best opportunity to break the deadlock with an overhit pass at the vital moment. It was a passage that just about summed up the night. ST PAT'S ATHLETIC: - Murphy; Madden, Toner, Desmond, Bermingham; Garvan, R Brennan; Byrne (Turner 84), Markey (Kelly 90), Clarke; Fagan (Keegan 90). DUNDALK - Rogers; Gannon, Cleary, Hoare, Massey; Shields (Chvedukas 82), Benson; Connolly, Murray, (Adorjan 71) Duffy; Hoban (Tagbujami 74). REF - R Rogers (Dublin).